Beads of sweat run steadily down my back as I lumber back home from my morning walk. It's only 9 a.m. but it feels like noon. I look up at the sky, hoping to find a hint of clouds, but the blistering rays on my forehead tell me that no relief is in sight. My dogs are sprawled out on the patio, soaking up their daily dose of vitamin D. In just a few minutes, they start to breathe rapidly and amble into the kitchen to cool down. I plop a few ice cubes into their water bowl for a chilly treat. 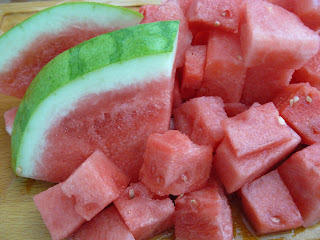 In this scorching heat, I think of biting into a cool, juicy watermelon to chill out. When choosing a whole watermelon, the World's Healthiest Foods website says, "look for one that is heavy for its size with a rind that is relatively smooth, not overly shiny or overly dull. One side of the melon should have an area that displays a yellowish or creamy tone. This is the underbelly, the place that was resting on the ground during ripening. If the fruit does not have this marking, it may have been harvested prematurely, which will negatively affect its taste, texture and juiciness". 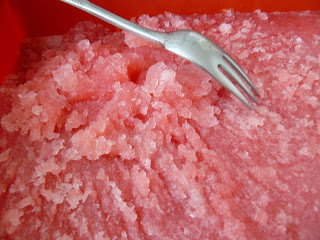 And what better way to crank up the chill factor than with a Watermelon Granita! Plan ahead, as you will need about 10 hours freezing time before it's ready to enjoy. 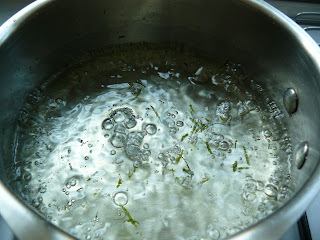 Combine 1 cup water, sugar and lime peel in a pan. Bring to a boil. Remove from heat and let cool. Pour through a fine strainer into a bowl. 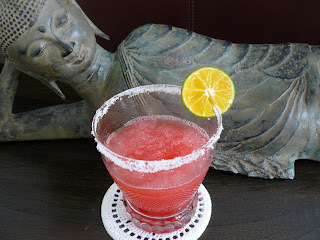 In a blender, whirl watermelon and 1 cup of the lime syrup until smooth. Pour mixture through a fine strainer into another bowl. Stir in the lime juice. Add more syrup to taste (mixture will taste less sweet once frozen). 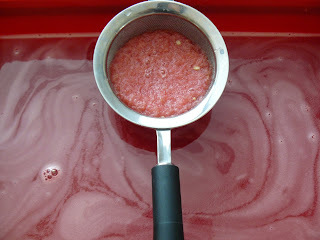 Pour puree into a square baking pan or container. Cover and freeze until mixture has started to freeze at the edges but is still slushy, about 2 to 3 hours. Stir the mixture thoroughly, scraping the sides down. Cover and freeze until solid, at least 8 hours. To serve, scrape with a fork to make large flakes and spoon into chilled glasses or bowls. Why stop at that? To serve as a cocktail, dip a glass lightly into a shallow plate of water (or remaining sugar syrup), then dip into a plate of salt (or sugar if you prefer). 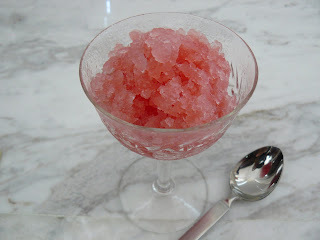 Fill glass with granita, add a splash or two of vodka or rum, and a squeeze of lime. Mix and enjoy! I'd like a vodka granita, thank you! A toast to your new restaurant, mitos!